With fresh insight from new co-author Andrea Campbell, We the People, Twelfth Edition, once again sets the standard for showing students how government impacts their lives and why it matters who participates. Campbell relates true, personal stories of how government affects ordinary citizens. This focus is reinforced by the book’s signature “Who Are Americans?” and “Who Participates?” features which motivate critical thinking about how Americans experience and shape politics. Learning goals ensure that students maintain consistent focus on core concepts in the text, in its companion InQuizitive learning tool, and in supporting critical-thinking exercises. 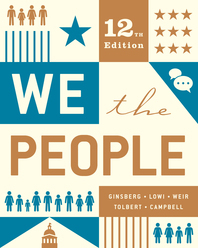 Since the first edition, relevance has been central to We the People. The Twelfth Edition takes this to the next level by incorporating the work of Andrea Campbell. Her teaching and writing focus on clarifying concepts and getting students to care about government and politics. Campbell’s students are not political science majors and don’t easily see how politics affects their lives. Her mission is to show them why it matters. Beyond her new chapter openers and “What Do We Want?” conclusions, Andrea Campbell’s passion for politics and government draws students in as she clearly articulates how government affects Americans’ lives. The Norton suite of resources for We the People includes tools that help students understand the reading and apply what they’ve learned. This helps ensure they arrive better prepared for lecture. Assessing students is easy with a variety of activities created specifically to complement the book. The Twelfth Edition provides a 21st-century perspective on the ways race, ethnicity, gender, wealth, age, religion, and geography intersect with government and politics.